Citizen Water Map Lab, Julian Priest, Common Ground Public Art Festival 2017. Image: Dionne Ward. Tracking a satellite in a tragic death spiral and getting to delete your personal information, or getting workers to not have to feel like they have to pretend they know what they're doing all the time - art and business and art and science: in this interview from the Urban Dreams Monthly lunches at Toi Poneke Wellington in March we hear from artist Julian Priest and theatremaker Leo-Gene Peters (from company A Slightly Isolated Dog) about two very different fledgling Wellington residencies that embed artists in the workplace. Julian Priest at Thomas King Observatory, Wellington Botanic Gardens: “This residency came out of a conversation I had with Tamsin Falconer at the Carter Observatory about something we might do together. We had about 20 or 30 good ideas in this conversation and at one point I think I said: “Is there something in that little building at the top of the Botanic Gardens?” And it turned out it was being used as a storage area. So we went through a quite informal process and later realised it had the makings of a residency space. “I was there informally for a couple of months late last year testing antennae, and then we started formalising the process and getting the building into a place where it could be used as a public space. Now I am artist in residence at the Thomas King Observatory. It’s been a very ‘Letting Space’ way of working. This is a quite small shed-like 1912 observatory with a beautiful wooden dome looking out over the city - it’s a fantastic place. 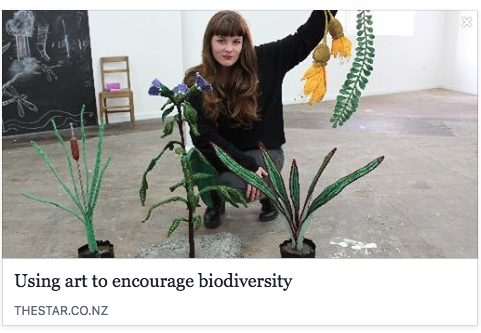 What I’ve brought to it is an existing project, partly now being funded by the Wellington City Council Public Art Panel, that has been running for a number of years. "It is an artwork called The Weight of Information. Basically, it’s a very small satellite which is put into orbit. I’m using a tiny two-centimetre satellite as material for a participatory artwork. The project was first launched in 2014 when I was living in Whanganui and we did about 20 different international events around this, the satellite launch, some involving schools, some in galleries. The satellite did get into space but unfortunately it malfunctioned and so we will launch again later this year. “The observatory is the perfect place for this project because the satellite itself is in space – you can’t see it, it’s spinning around the Earth – but what you can do is track it. I am building a robot radio antennae in the dome and staging a series of participatory events called Meet to Delete. The idea is that the satellite is like a tragic hero in the classical sense who is unfortunately pulled back down to earth in a tragic death spiral by gravity, so he is trying to stay in space, trying to ascend by forgetting things. He collects information through sensors, getting in all the information he can and immediately erases it. He hopes by deleting all this information that he’s going to ascend into the heavens, in some kind of anti-rational transcendence. On Earth I’m inviting people to the observatory to shred their documents to make the world a little lighter. “We ran these events before and people turned up with whatever personal information they wanted to let go of. It was kind of cathartic for people. They brought quite personal documents, including bank statements with someone’s first ever mortgage payments and someone else burnt four boxes of documents of the legal proceedings of their divorce. All going well sometime after July this rocket will again launch and the satellite will go into space and flawlessly work! Leo Gene Peters (A Slightly Isolated Dog) at Creative HQ: “We became artists in residence at Creative HQ mid last year, when Stefan the CE there had a conversation with Brian Steele from Giddy Up about wanting an artist in residence. Since its been a pretty loose, organic process. We said that we really didn’t know what we would do and he said “Sounds good, let’s figure it out”. I’ve been in and out of the city so I’ve come back in and out and we’ve done little bits and pieces of work over that time facilitating revisioning they’ve been doing. “It’s been a long term vision for us and our producer Angela Green - who is just finishing her MBA after years working in the theatre as an actor and in producing and arts management - to explore how arts and business can talk to one another. We need to have a meaningful crossover and relationship between art and business, because there’s not. So we’ve been dreaming about how we do that. The residency at Creative HQ is a perfect fit. It’s nice to get to know people and slowly connect, and now we’ve come back we are running a project with them where we are creating a professional development programme which is also a show, over eight weeks with their staff and different clients - different accelerator and incubator programmes. “We kind of know what the form of it is going to be, we’re getting closer, but its a pilot programme for us and for them. We’ve had lots of conversations and they are very supportive and keen to see it as one aspect in the future of how they want their company to go – using creative resources, artists and different modes of working to grow and progress their own models. That’s it in a nutshell. What might these residencies evolve into? Thinking ahead, thinking big. Julian Priest: “It’s probably the most productive space I’ve been in in Wellington. I think it’s something to do with it being a beautiful place, with amazing support. We haven’t got a financial arrangement yet but the support of the crew up there is fantastic, a very generous organisation. In terms of the future, it’s very unusual for me to be in residency because I never go to them these days. I used to go on short ones, but with a family it’s harder to find the time. There are some fantastic overseas art/science residences, like with the Hadron Collider, at the South Pole, with the ESA. So a residency that I can do in the city is a real treat. On the tension between being given a space you’re able to do what you wish with, as a form of social generosity and working with an organisation with a need for outputs, structure and giving back value. Leo-Gene Peters: “We’ve been dreaming and thinking about this kind of residency for... well I mean we were resident at Downstage Theatre before it fell over. And while we there we were exploring how we could work with people there. So we’ve always been about the outcome. Like, how do you frame it so that its outcome focussed? How can you speak in a language that people in the corporate world know what you’re on about? We’re still working out how we do it. How we can be practical and specific and responsive enough. Leo-Gene Peters: “Well in this instance they’re used to this kind of stuff, they really like it. Some of them come up and introduce themselves to us. But it is a question of how you interrupt their day. Like they’re in the middle of that email they have to send because their deadlines up and I come up. So it’s constantly feeling out how we do more of that - because its useful to break the day. Not to mess with people, but to to take a moment before we move onto the next thing. Its working out how you propose it. “Using an organisation as material. I’m trying to imagine what that might look like in some some other organisations, like a government department where you’re messing with the bureaucracy slightly! Leo Gene Peters: “At Creative HQ they’re interested in the creative problem solving. In being able to revision the thing or shift process drastically, on a dime. To risk something. And then fail, and be okay with failing, and then go ‘Cool, how do we evolve’. That’s the thing I think they like about us. They want to work differently. “I pitched it once to them as a moment where we’re vulnerable together. It’s like the story of me walking into the first session I ever ran with Creative HQ going to myself ‘they’re all going to figure out I’m a fraud!’ And I’m like “Outcomes” and “KPIs” to them, and then I just stopped and went to myself ‘you’re not doing that’. So we started playing games and they were reticent at first and then really got into it. It’s that moment of being able to go “I don’t know what I’m doing. Has anyone else been in a moment where they don’t know what they’re doing?” And people, say, yeah, all the time. We pretend all the time.